I got the idea for starting this blog from a presentation I made at a meeting of the Texas Land & Mineral Owners’ Association, titled “Checklist for Negotiating an Oil and Gas Lease.” TLMA posted the outline of my presentation on its website. I soon began receiving calls from people who had found the article on the net. I had no idea that the article had found its way to the net, but the popularity of the checklist led me to believe that landowners might profit from other articles of interest to them on matters related to oil and gas exploration and development. The oil and gas lease is the foundational document on which the oil and gas industry in the US is based. Its form and provisions have been modified and shaped over the years to respond to changing industry practices and developments in the law, but its essential form has remained unchanged since the latter half of the 19th century. It is one of the most commonly used and successful legal documents in US commerce. So, I thought it would be a good idea to write a few posts focused on the oil and gas lease, of which this is the first. 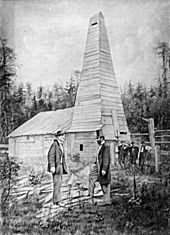 The basic concept and form of the oil and gas lease was developed in Pennsylvania, shortly after Edwin Drake drilled the first commercial oil well in Cherrytree Township, near Titusville, Pennsylvania, in 1859. The well was drilled to 69.5 feet at a cost of $3,000, and produced 12 to 20 barrels a day, but was never profitable and ceased production in 1861. But it started the first oil boom in the US. Drake is the man on the right, in front of his well. Drake’s form of “lease” was adapted from lease agreements developed for the purpose of allowing the mining of salt brine through the drilling of wells. Salt mining agreements allowed the lessee to drill a well to produce brine that would then be evaporated and processed into salt. The agreements typically provided for payment to the landowner of a portion of the salt obtained from his land, usually every twelfth barrel. An 1862 case decided by the Supreme Court of Pennsylvania is one of the earliest decisions involving oil rights. The dispute involved a salt mining lease. The lessee had discovered oil in the process of drilling for salt, and the question presented was, to whom did the oil belong? The court held that the well produced both brine and oil, and it was necessary to separate the oil from the brine in order to produce salt, so the oil belonged to the lessee. The first printed form of oil and gas lease was by a Mr. J.A. Heydrick of Oil City, Pennsylvania. His first lease form was published in about 1870. His Oil Lease No. 3, published in 1880, is recognizable as the basic form of oil and gas lease still in use today. It granted a lease for a term of 15 years “and so long thereafter as oil or gas can be produced in paying quantities.” Heydrick’s OIl Lease No. 4 Form became the standard oil and gas lease form in Pennsylvania. For many years after leases began to appear, courts struggled with the legal nature of the rights granted to the lessee. Today, in most states — including Texas — courts agree that the lease grants to the lessee a fee simple determinable in the mineral estate in the land. “Fee simple” is the legal term for ownership. The word “determinable” means that the estate will terminate and revert to the lessor at some time in the future, when production has ceased. So the term “lease” is misleading. An oil and gas lease actually grants title to the mineral estate for the term of the lease. The lessor reserves a royalty interest — also a real property interest — in production for the term of the lease. So the lease creates two different real property interests in the minerals — the ownership of the oil and gas, sometimes called the “working interest” or the “mineral leasehold estate,” which belongs to the lessee, and the royalty interest reserved by the lessor. Both are interests in land and treated as such under the law. Next installment – the essential terms of the oil and gas lease.